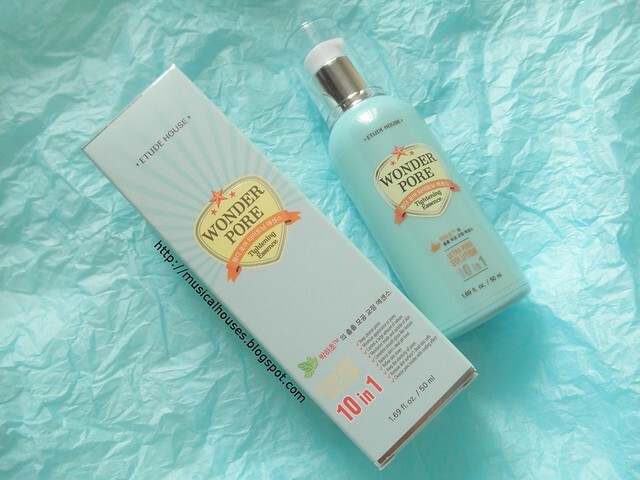 Etude House's Wonder Pore skincare range is a pretty popular one, targeting the concerns of oily skin and enlarged pores which are common among young women. 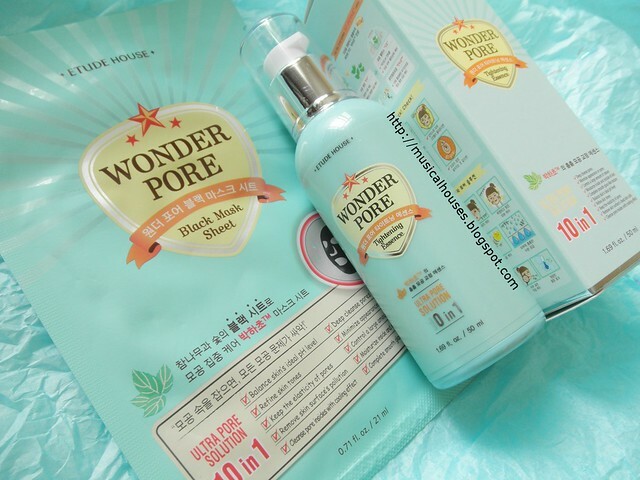 Now, Etude House's Wonder Pore range has expanded to include two new products - the Wonder Pore Tightening Essence, and the Wonder Pore Black Sheet Mask. 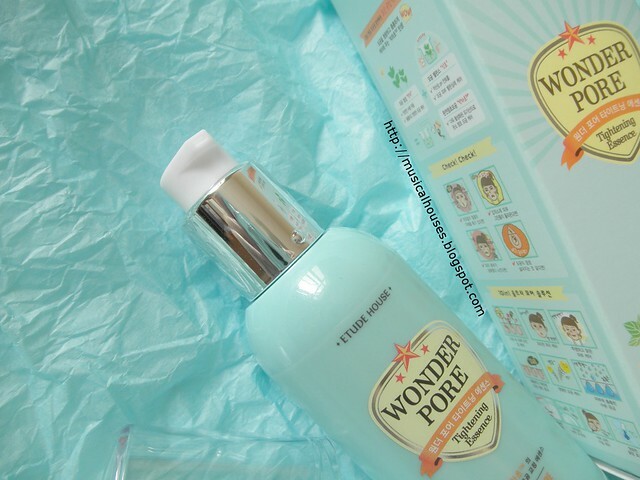 I had previously reviewed the Wonder Pore Freshner, which is one of the key products of the Wonder Pore range, so I decided I had to follow up and review the new additions too! I decided to review both products, and while I don't quite have the young, oily skin these products are geared for (I do have some oiliness, but a lot of oil-control skincare is too harsh for me), I figured I could still break down the products and see how they worked, in addition to just sharing my experiences with the products. So, of course to do that, we start at the ingredients list! We start with the Wonder Pore Tightening Essence. 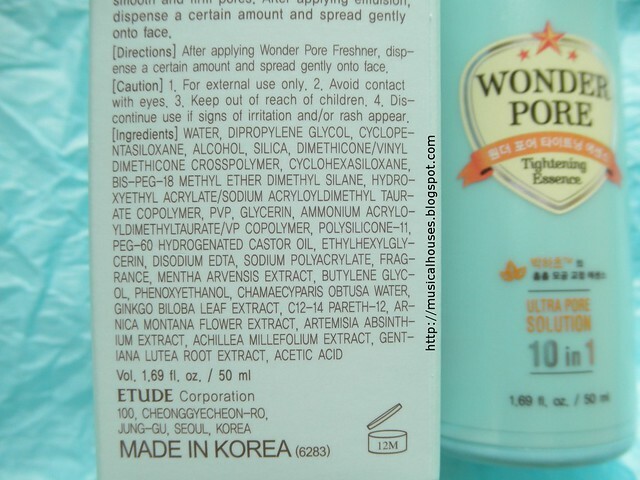 The main ingredients in the product are Water, humectants (Dipropylene Glycol, Glycerin), silicones and polymers, which mainly are film-formers and other ingredients to enhance the feel of the product, although some also have emollient effects (Cyclopentasiloxane, Dimethicone/Vinyl Dimethicone Crosspolymer, Cyclohexasiloxane, Bis-Peg-18 Methyl Ether Dimethyl Silane, Hydroxyethyl Acrylate/Sodium Acryloyldimethyl Taurate Copolymer, Polysilicone-11), Alcohol, absorbents (Silica), and functional ingredients like binders, emulsifiers, and so on (PVP aka Polyvinylpyrrolidone, Peg-60 Hydrogenated Castor Oil)/ After that, we hit the preservatives (Ethylhexylglycerin and Disodium Edta are the main ones, although Phenoxyethanol is there too), which means that everything after Ethylhexylglycerin is there in fairly minor amounts. The rest of the ingredients, after the preservatives, include the plant extracts and ingredients mentioned (Mentha Arvensis Extract, Chamaecyparis Obtusa Water, Ginkgo Biloba Leaf Extract, Arnica Montana Flower Extract, Artemisia Absinthium Extract, Achillea Millefolium Extract, Gentiana Lutea Root Extract), so I doubt they are there in very meaningful amounts. The rest of the ingredients include Fragrance, more absorbents (Sodium Polyacrylate), emulsifiers (C12-14 Pareth-12), a humectant (Butylene Glycol), and a buffering agent (Acetic Acid). So, as far as the main ingredients in the Wonder Pore Tightening Essence go, we have water, a couple of humectants, alcohol, silica, and a whole bunch of silicones. I guess that this would be good if you have very, very thick and oily skin, but for most other skin types, I'm not sure if I could recommend this - for one, alcohol is the 5th ingredient in the list, and in high concentrations, alcohol can be drying to the skin. Normally the main exception to this would be if the product was otherwise very oily or thick or emollient, and then the inclusion of alcohol in such a formula could help to make the product less thick and difficult to spread. But in the case of the Tightening Essence, you have some very lightweight humectants and silicones, as well silica which is as an absorbent, so the product wouldn't be so thick or oily that it would need the alcohol. 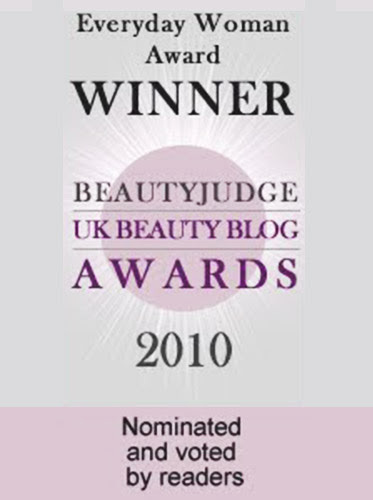 So, yes, while I've written on my blog before that alcohol isn't necessarily all that bad, depending on the formulation, in this case I do think some concern over the alcohol content is warranted if you don't have particularly thick or oily skin. So, how does the Tightening Essence actually feel on skin? As expected, it is a light, clear gel, and has a citrus scent. When applied, it sinks into the skin really fast, ad leaves no residue. Despite the high alcohol content, it didn't feel that drying on my skin, but I can imagine that anyone with dry or sensitive skin might not like it. This is probably not sufficient as a moisturizer in its own right, it's best layered under something more emollient. 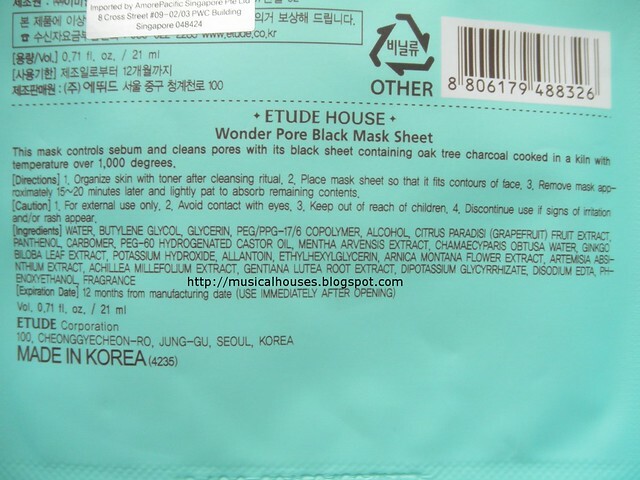 Now, we look at the Etude House Wonder Pore Black Mask Sheet. The main ingredients are water, humectants (Butylene Glycol, Glycerin,Panthenol), Alcohol, polymers (Peg/Ppg-17/6 Copolymer, Carbomer), emulsifiers (Peg-60 Hydrogenated Castor Oil), and some plant-based extracts (Citrus Paradisi (Grapefruit) Fruit Extract, Mentha Arvensis Extract, Chamaecyparis Obtusa Water, Ginkgo Biloba Leaf Extract). After that, we hit a pH adjuster (Potassium Hydroxide), which is used in small amounts in skincare, so these ingredients make up the bulk of the product. After the pH adjuster, the rest of the ingredients are some preservatives (Ethylhexylglycerin, Disodium Edta, Phenoxyethanol), Fragrance, some skin beneficial ingredients (Allantoin, Dipotassium Glycyrrhizate), and the other plant extracts (Arnica Montana Flower Extract, Artemisia Absinthium Extract, Achillea Millefolium Extract, Gentiana Lutea Root Extract). Again, looking at the main ingredients, we have water, humectants, polymers, and alcohol. Again, alcohol is 5th in the ingredients list, and the rest of the formulation of the Black Mask Sheet is quite light and thin, which means that the alcohol would be a concern for those with dry or sensitive skins in this product as well. 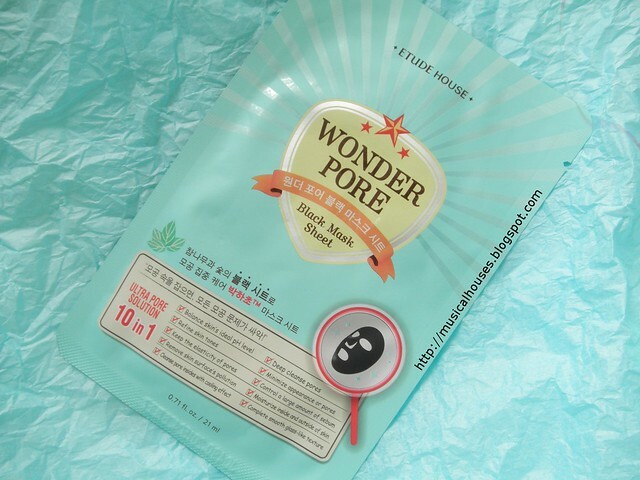 So, how does the Wonder Pore Black Mask Sheet perform on skin? When applied, it doesn't feel that different from the ordinary mask, although the essence in the mask doesn't feel as sticky as that in some other sheet masks (presumably because the alcohol removes some of the sticky feeling). It was alright on me, neither particularly drying nor super-moisturizing, but I can imagine this mask not being moisturizing enough for girls who don't have oily skin. There was also a light scent to the mask. Also, the sheet mask is black, and apparently Etude House claims that this is because the mask is imbued with charcoal. I've actually done a pretty in-depth look at charcoal in skincare, whether it works, and what the science says about it, and basically there is no clear science indicating that putting charcoal in your skincare helps improve the condition of your skin. 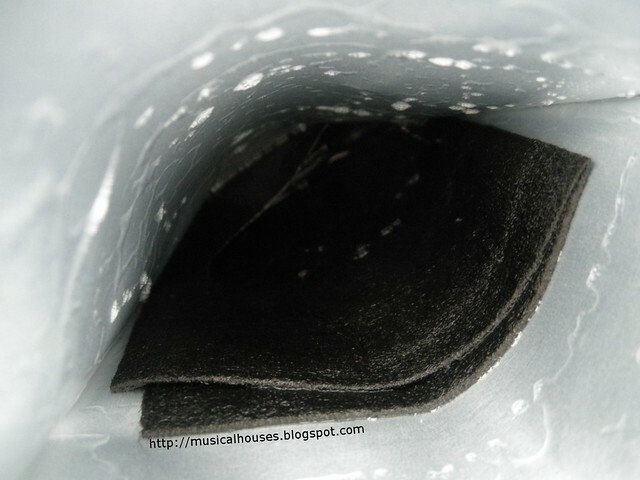 Of course, the black colour of the mask is pretty cool from an aesthetics perspective, and as consumers we are extremely suggestive to things like the scent and colour of the products, so I'm sure the Black Mask Sheet is going to be a hit with its customers, but for me, it's a nice-but-not-necessary feature. 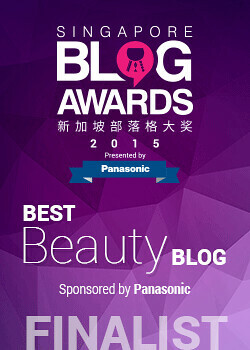 So, would I recommend the Wonder Pore Tightening Essence and Black Sheet Mask? 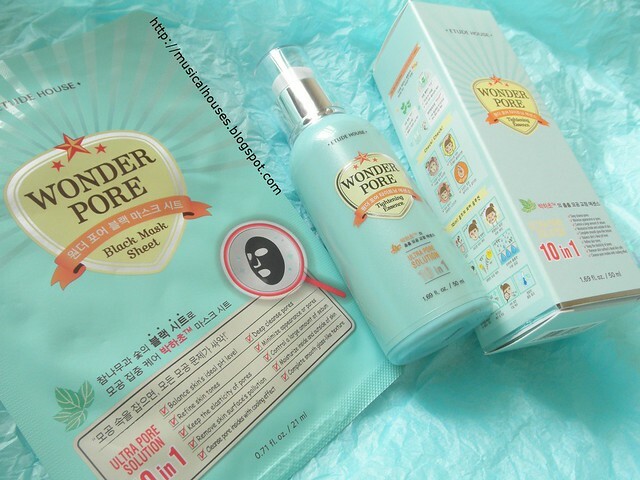 As with my previous review of the Wonder Pore Freshner, I would say: only if you have thick and oily skin, and are looking for skincare that makes your skin feel less oily! If that's you, then buying products that are mostly water, humectants, silicones, polymers and alcohol might make sense. But for people with dry or sensitive skins, I doubt this will be sufficiently moisturizing - and if you are like me, the high alcohol content in the products will be a concern, as it might be quite harsh in removing the skin's oils (which I guess is probably the point of the Wonder Pore range). And at $32 for the Tightening Essence and $5 for the Black Mask Sheet, the prices aren't exorbitant - certainly there is more expensive skincare - but they aren't exactly cheap given the formula (again, mostly water, humectants, alcohol, silicones and polymers). So that's my view, which I guess pretty much flies in the face of other reviews I've seen. 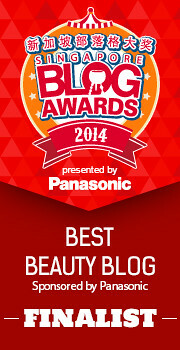 For the most part, other bloggers seemed to like the products. In fact, as far as I know I'm probably the only blogger who was sent these products for review, and who has surfaced a less-than-OMGZ-raving-so-positively review on these products. I suspect if I had tried these products 15 years ago, when I was a teenager with a face that seemed to be moulting oil, I think I might have liked these then. But now, when I'm nearly 30, I don't think I have the thick, oily skin suitable for these products, and the alcohol content is a concern for me. Still, it doesn't mean the brand is all bad - there are plenty of other great Etude House products, particularly their makeup, which I've always found to be great and inexpensive, with cute packaging to boot (and have plenty of other reviews to demonstrate this). The Bottom Line: With a formula consisting primarily of water, humectants, and alcohol, the Wonder Pore Tightening Essence and Black Mask Sheet are products probably best suited to people with thick, oily skin, who are looking for products to remove the oils from their skin.